Houston Texans defensive end J.J. Watt must still think the 'Hard Knocks' cameras are on him, as he peppered a workout with Chris Farley impressions. 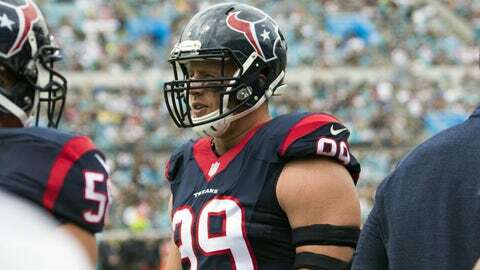 Are you sick of J.J. Watt yet? Too bad, if you are. The Houston Texans defensive end is everywhere you look right now. If he’s not dressing as Batman, he’s flirting with Kelly Kapowski. If he’s not going on about Jennifer Aniston, he’s taking batting practice with the Astros. Oh, and then there was the whole entire season of Hard Knocks, which spent what felt like half the season chronicling Watt’s zany ways and ultra dedication to his craft. On Tuesday, the legend of Watt grows even bigger, thanks to ESPN. The All-Pro will be featured on “E:60” in a segment that apparently will take a look at Watt’s path to the NFL and how he’s become a star. ESPN released a couple of clips from the segment, including one of Watt preparing for a workout by doing a Chris Farley impression and reciting lines from popular movies like “Step Brothers” and “Old School.” If you’ve grown to dislike Watt, the video will make your blood boil. If you love him, well then you’ll love the video.